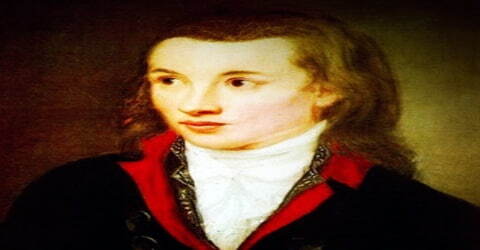 Novalis – German poet, author, mystic, and philosopher. An early German Romantic poet and theorist who greatly influenced later Romantic thought, Novalis was born as Georg Philipp Friedrich von Hardenberg on 2 May 1772at Oberwiederstedt manor (now part of Arnstein, Saxony-Anhalt), in the Harz mountains. Novalis’s professional work and university background, namely his study of mineralogy and management of salt mines in Saxony, was often ignored by his contemporary readers. The first studies showing important relations between his literary and professional works started in the 1960s. Mostly known to the world by his pseudonym of Novalis, Georg Philipp Friedrich von Hardenberg gave a deep insight of all subjects and made significant contributions in the field of aesthetics and philosophy of art in his short life of 28 years. His works have touched various issues such as epistemology, moral theory, political philosophy, problems of interpretation, philosophy of history, philosophy of religion, and so on. His theories and work greatly influenced the later Romantic thought. 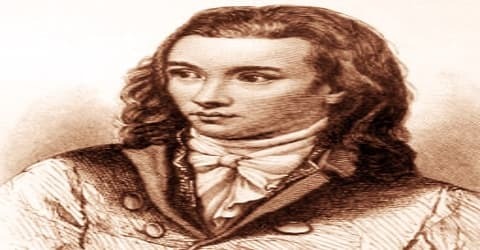 Novalis was widely read and equipped himself with knowledge in all sorts of subjects’ right from science, law, philosophy, politics and political economy. It was the notes that he made on his field of knowledge that he later used to draw the connection and provide an encyclopaedic overview of art, religion, and science. In his short existence, he lived to see only a couple of his works being published. It was posthumously that many of his works, some of which were unfinished while some were compiled from the notes that he made, were published. Novalis (German: noˈvaːlɪs), pseudonym of Friedrich Leopold, Freiherr von (baron of) Hardenberg, was born on 2nd May 1772 at Oberwiederstedt manor (now part of Arnstein, Saxony-Anhalt), in the Harz Mountains. In the church in Wiederstedt, he was christened Georg Philipp Friedrich. An oil painting and a christening cap commonly assigned to him are Hardenberg’s only possessions now extant. His father was an avid follower of pietism and a member of the Moravian (Herrnhuter) Church. Hardenberg was the second of the eleven children born to the couple. Coming from Low German nobility, he was christened Georg Philipp Friedrich in the church. It was later on that he took on the pseudonym Novalis from ‘de Novali’ a name that his family formerly used. He was initially home-schooled by private tutors. It was only later that he attended the Lutheran grammar school in Eisleben, learning rhetoric and ancient literature. Young Hardenberg studied law from 1790 to 1794 at Jena, Leipzig, and Wittenberg. He passed his exams with distinction. During his studies, he attended Schiller’s lectures on history and befriended him during his illness. He also met Goethe, Herder, and Jean Paul, and befriended Ludwig Tieck, Friedrich Wilhelm Joseph Schelling, and the brothers Friedrich and August Wilhelm Schlegel. Hardenberg finally completed his studies from Wittenberg in 1794. Other people that he met and became friends with during his educational journey were Goethe, Herder, Jean Paul, Ludwig Tieck and Friedrich Wilhelm Joseph Schelling. In 1794, Novalis met the 12-year-old Sophie von Kühn (1782-1797), a girl who was, according to accounts, a “perfectly commonplace young girl, neither intelligent nor particularly beautiful.” Nonetheless, he fell in love with Sophie, since in the young Georg Philipp’s view of the world “nothing is commonplace” because “all, when rightly seen, is symbolic.” On 15 March 1795, when Sophie was 13 years old, the two became engaged, despite her family’s reluctance and the fact that she was already tubercular. The early death of Sophie in March 1797, from tuberculosis, affected Novalis deeply and permanently. She was only 15 years old, and the two had not married. In October 1794, Novalis started working as an actuary for August Coelestin Just, who became not only his friend but, later, also his biographer. The following January, he has appointed an auditor to the salt works at Weißenfels. In 1795-1796, Novalis entered the Mining Academy of Freiberg in Saxony, a leading academy of science, to study geology under Professor Abraham Gottlob Werner (1750–1817), who befriended him. During Novalis’ studies in Freiberg, he immersed himself in a wide range of studies, including mining, mathematics, chemistry, biology, history and, not least, philosophy. It was here that he collected materials for his encyclopedia project, Das Allgemeine Brouillon. Similar to other German authors of the Romantic age, his work in the mining industry, which was undergoing then the first steps to industrialization, was closely connected with his literary work. Meanwhile, from 1795 to 1796, he underwent a detailed analysis of the scientific doctrine of Johann Gottlieb Fichte, who changed his view and thinking. He carried Fichte’s work and doctrine further by transforming the latter’s view and hence laying the foundation for his Liebesreligion, religion of love. Novalis’ first fragments were published in 1798 in the Athenäum, a magazine edited by the Schlegel brothers, who were also part of the early Romantic movement. Novalis’ first publication was entitled Blüthenstaub (Pollen) and saw the first appearance of his pseudonym, “Novalis”. In July 1799, he became acquainted with Ludwig Tieck, and that autumn he met other authors of so-called “Jena Romanticism”. Novalis expressed his grief in Hymnen an die Nacht (1800; Hymns to the Night), six prose poems interspersed with verse. In this work, Novalis celebrates the night, or death, as an entry into a higher life in the presence of God and anticipates a mystical and loving union with Sophie and with the universe as a whole after his own death. In 1797 he went to the Academy of Freiberg to study mining. Novalis became engaged (to Julie von Charpentier) in 1798, and a year later he became a mine inspector at the saltworks at Weissenfels. In 1800, Novalis penned a six prose poem interspersed with verse, entitled, ‘Hymnen an die Nacht’. Through it, he expressed his deep embedded grief and sorrow after the death of Sophie. 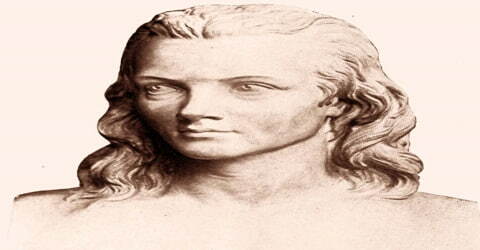 Novalis worked on the theme of life and death which according to him were entwined concepts. The work is today considered as the most important poetry of the German early Romanticism. His mythical romance Heinrich von Ofterdingen (1802), set in an idealized vision of the European Middle Ages, describes the mystical and romantic searchings of a young poet. The central image of his visions, a blue flower, became a widely recognized symbol of Romantic longing among Novalis’s fellow Romantics. In the essay Die Christenheit oder Europa (1799; “Christendom or Europe”), Novalis calls for a universal Christian church to restore, in a new age, a Europe whose medieval cultural, social, and intellectual unity had been destroyed by the Reformation and the Enlightenment. From August 1800 onward, Hardenberg was suffering from tuberculosis. On 25 March 1801, Novalis died in Weißenfels. His body was buried in the old cemetery there. While some of his works such as Pollen, Faith, and Love and Hymns to the Night were published during his life, his unfinished novels such as ‘Heinrich von Ofterdingen’ and ‘The Novices at Sais’ were published posthumously. His unfinished political speech and the essay ‘Die Christenheit oder Europa’ (Christendom or Europe) was published posthumously. His notes from 1798 to 1799 were collected and later clubbed to form the work, ‘Das Allgemeine Brouillon’ which is published in English as ‘Notes for a Romantic Encyclopaedia’. The notes drew a connection in the sense of encyclopaedic overview of art, religion, and science.